It is widely acknowledged that patients with MS are different in terms of clinical needs, preferences and treatment goals. For MS patients, providing greater opportunity for successful management of the disease and its progression requires the availability of a broad range of therapeutic alternatives. Often, a treatment option that is effective and has few side effects in one MS patient may produce the opposite result in another due to the diverse nature of the disease. Additionally, different patients may require different treatments depending on their preferences or treatment goals – some patients may place more weight on slowing disease progression, while others may be concerned about safety and side effect profiles. Fortunately, as a result of treatment advances over the past several decades, a range of options are now available to meet the wide variety of needs of people with MS. The variability in treatment needs and preferences among MS patients found in Real Endpoint’s research is also why population-level judgements of an MS treatment’s value, like the recent value assessment conducted by the Institute for Clinical and Economic Review (ICER), often fail to capture the true importance of these medicines to patients. ICER’s payer-centric value assessment also doesn’t capture significant differences in what patients value in MS treatments compared to what payers value in how MS patients are treated. If misused by payers and policymakers, ICER’s assessment could also impede successful management of MS by limiting patient and provider choice, which is critical to managing and slowing progression of the disease. MS patients define value differently than payers and physicians. Patients ascribe highest value to a medicine’s effect on MS symptoms (such as fatigue and walking difficulty) relative to a medicine’s efficacy. On the other hand, payers and physicians are more concerned with disease progression, effect on relapse rate and effect on severity of relapses. 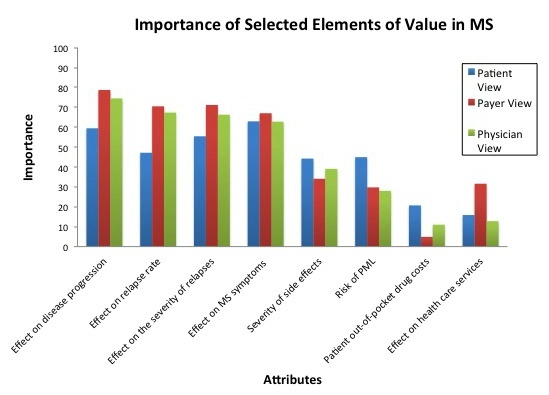 Patients are more concerned about a medicine’s safety characteristics (e.g., severity of side effects, interactions with other medications) than payers or physicians. Unfortunately, population-level judgements of value do not always align with the prioritization of patient preferences found in Real Endpoint’s research. Stakeholders who commented on ICER’s MS report noted that ICER emphasized efficacy over safety in its assessment. Patients are more concerned with out-of-pocket costs than payers, who are primarily concerned about the medicine’s effect on health care services needed to treat MS. ICER’s assessment focuses on the cost-effectiveness and short-term budget impact of an MS treatment. While this information is useful to payers, it fails to acknowledge the costs that matter to patients.